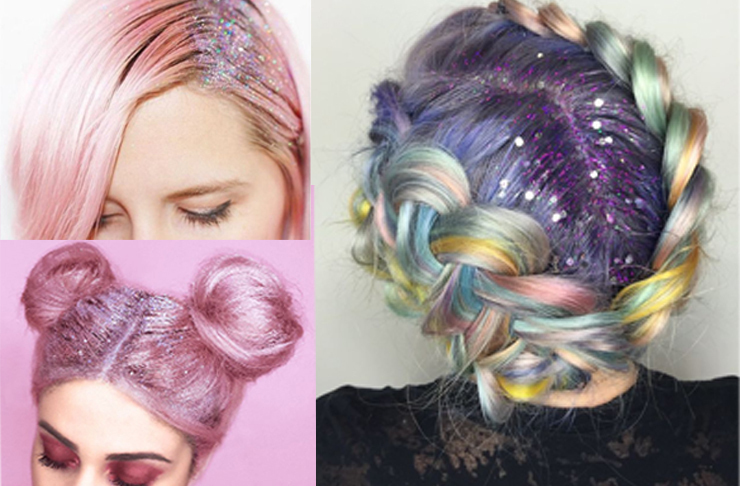 Glitter Roots is the hair trend that has definitely won 2015—and we have the down-low on how you can do your own. An easy trick to cover up dirty roots when you’re feeling particularly lazy, or a gloriously childish way to celebrate the merry season (your mum will never order you to get more involved in Christmas again ever), here’s how you can DIY glitter roots. Leftover orange glitter from Halloween? Smushed blue sparkles from a baby shower? Pick them out from the carpet and mix them in a bowl! Or if you can afford the spare dollar, go down to that local store which sells a disturbing amount of everything and pick just one glittery colour for your regrown roots. Using your astounding natural sense of touch, find your natural part at the top of your head. Follow it down the centre, until you have an even right and left side of your hair (obviously). Using a handheld mirror (if you don’t have one please leave), check that you’ve found the correct part and adjust if necessary. If you don’t want glitter in your bangs or fringe, now’s the time to pull them aside with a clip. Pull your hair into two high buns, ideally sitting near the top of your head. This is just to keep the hair out of the way, so these don’t have to be perfect. Grab your pre-prepared bowl of glitter-gel mix and start applying from the roots outwards. You can glitter-fy the surface area of your hair as much as you like, although it IS called glitter roots for a reason. Don’t let that stop you though. The dudes on this Insta page have applied glitter to their beards and we must say they look pretty smashing. The glitter beard is maybe even better than the girl-version. You’d better test glitter roots on your dog, cat and mother too - for research, obviously. If you want to see glitter roots done IRL, you can find an in-depth how-to video below. PS - The Urban List does not take responsibility for any glitter leftovers found on but not limited to: your pillow, shower, couch, kitchen and/or carpet. Glitter roots will wash out after an unspecified number of washes. You may need to be persistent.